This past Tuesday, May 8, ten-time Grammy winner Taylor Swift kicked off her very anticipated “Reputation” tour in Glendale, Arizona. The audience was over 60 thousand screaming fans–breaking the record for a concert tour attendance, whom was previously set by One Direction. This is Swift’s fifth concert tour. Her previous world tour “1989” started on May 5, 2015 and finished up on December 12 that same year. The tour earned over $250 million and broke the record for most profitable tour of 2015 and the most profitable U.S tour in history (which was held by the Rolling Stones for over 10 years). Taylor Swift started her “Reputation” era by deleting all of her posts on all her social media sites after she had already been rogue for a couple of months. She then started posting pictures of a snake on her Instagram–subtly hinting at what her album was going to be based about (how everyone was calling her a manipulative snake and someone who should not be trusted). The “Reputation” tour setlist has top hits from her album including, “Look What You Made Me Do” (whose video broke the Vevo 24-hour record for most streamed video, ever), “End Game”, and “New Year’s Day”. The tour also has songs from her previous albums such as, “Shake It Off”, “Love Story”, and “We Are Never Ever Getting Back Together”. 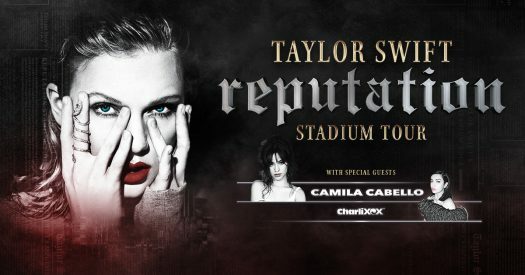 But, before you can see Taylor Swift, you have two amazing female singer-songwriters opening up the tour for her: Camila Cabello, and Charlie XCX. So far Swift has 53 tour dates set already, but there are sure to be more to come in the near future!